YOU read a good novel, you want to read others written by the same author and find out more about him or her. I read a very good one entitled The Hero’s Walk by Anita Rao Badami, published a few months ago by Bloomsbury. Most novels have a few lines on their jackets about the author. This had nothing besides excerpts of a few reviews comparing it to V.S. Naipaul’s A House for Mr Biswas, novels of Rohinton Mistry and Shauna Singh Baldwin. It was described "heart-breaking". It also mentioned an earlier novel with an enigmatic title Tamarind Mem. I felt very frustrated and set out to nearby Khan Market which has six bookstores to see if I could lay my hands on another copy of The Hero’s Walk which had been lent to me by a friend and whatever else I could by the author. I drew a blank. Only Rachna Davidar, owner of Book Shop, was familiar with the name. Tamarind Mem had been sold out. From The Hero’s Walk I surmised that Anita Rao Badami was from Karnataka and was now living in Vancouver, perhaps with a Canadian husband. I was wrong. My friend who had recommended the novel to me got more authentic information from the Internet. Anita Rao, born in Rourkela, is a Kannadiga. Educated in Chennai, she now lives in Canada with her Indian husband. She wanted to write books for children but while doing a course in creative writing was persuaded to write for adults. So came the two novels. Salman Rushdie: Genius or eccentric? The plot of The Hero’s Walk is very simple. It is about an orthodox family living in a town named Totupuram on the Bay of Bengal, East Karnataka, adjoining Tamil Nadu. They live in a large house on the Brahmin Street. The house was built by a prosperous lawyer who then took on a mistress who lodged a few houses down the same street. He dies leaving very little besides a disgruntled widow, a son Sripathi and a daughter Putti. Sripathi fails to become a doctor as his parents hoped and take on a poorly-paid job as a copywriter in an ad agency. He owes money to his bank and friends. His chief preoccupation is to write letters to The Hindu signed Pro bono Publico. He collects pens to do so. His wife Nirmala bears him a daughter Maya and a son Arun. Maya grows into a beautiful girl and wins a scholarship from a Canadian university. Before she leaves Totupuram, she is engaged to the son of a well-bred Brahmin family. In Canada she falls in love with a Canadian boy at the university and marries him. Sripathi Rao is humiliated and desolate. He cuts off all connections with his daughter. Maya has a daughter called Nandana. When she is seven, her parents are killed in a car crash. A mortified Sripathi has to travel to Vancouver and bring back a most reluctant grand-daughter and the ashes of his discarded daughter and Canadian son-in-law who he has never seen. Most of the novel is based in Totupuram and revolves round Sripathi’s family living in their ancestral home: his sister Putti, a spinster at 40, his mother a cranky old woman who quarrels with everyone around, a good-for-nothing son Arun, and a grand child pining to get back to Canada. For their neighbour they have a milk-vendor who becomes an MLA and a millionaire. His son eyes high-caste Putti and succeeds in marrying her to the disgust of Putti’s crazy mother. It is not only the story that keeps the reader riveted to the novel but also the way Badami etches her characters and gives the most trivial event a dramatic significance. She has a puckish sense of humour and a charming way of handling Kannada-English. This has been a good year for Indian writing in English. I can count at least six novels which will continue to be read in the years to come. The most memorable will be Anita Rao Badami’s The Hero’s Walk. Her name would be known the world over to people who take interest in current events, read periodicals or watch TV. She’s been in the print and electronic media for over 20 years, in the forefront covering the Afghan Civil War, the Naga rebellion, the Indo-Pak confrontation on the Siachen Glacier, LTTE’s battles against the Sri Lankan army and much else. She has been on the staff of The Indian Express, India Today, Time and CNN. She has won more awards for journalism, national and international, than any Indian journalist. And she is very easy on the eye: tall and curvaceous. Anita (nee Simon) was born in Kottayam (Kerala) to Syrian Catholic parents. Her father was an executive with Tatas and had postings in different cities. In 11 years Anita changed seven schools. She took her Senior Cambridge from Loreto, Calcutta, winning all the prizes and topping the list in English. She then joined Miranda House, Delhi. She was again the topper in English literature in BA honours which she passed in 1978. An academic career was wide open to her. Being a restless person, she opted for journalism and took a diploma from Bangalore University. 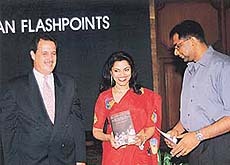 She was immediately taken on by Arun Shourie, then Editor of The Indian Express. After a short stint in Delhi, she asked to be transferred to Bangalore where her parents were living. There she met Pratap Chandran, a senior reporter and married him. He was a Hindu, she a Christian but that posed no problems with parents on either side being Malayalees. Anita Simon became Anita Pratap. A year later their son Zubin was born. The marriage soon went on the rocks. The divorce was fiercely contested over the custody of the child. Ultimately Anita won because Zubin meant more to her than any other person in the world. Having done all she wanted to do with journalism and reporting for TV channels, Anita turned to making documentary films. She would still have been making documentaries but for a chance encounter with a stranger at a cocktail party at Maurya Sheraton. She left the party early. So did the stranger. They exchanged greetings while waiting for their cars. "Why are you leaving early?" he asked. "I have to be with my son; he is waiting for me. And you?" He replied, "I too have a son at home waiting for me." They got talking. They had much in common: Both were divorcees with sons to look after. They decided to meet again. He was H.E. Arne Walther, Norwegian Ambassador to India, and 15 years older than her. Anita agreed to marry him. Now she is Her Excellency Anita Walther. I asked her if she had at any time been close to death during her years as reporter. "Many times," she replied with a smile. "In Afghanistan with bombs falling a few feet from me. In Sri Lanka with bullets whizzing past my ear. But once I was in hunt for an authentic story, I lost all fear and went for it." It occurred to me that quite a few Indian women journalists have shown more guts facing danger than their male counterparts: Tavleen Singh bearding Bhindranwale in his den, Pinki Virani cocking the snook at Bombay’s underworld dons, Barkha Dutt interviewing Pakistanis when tensions between the two countries were extremely high. Anita Pratap has recorded her adventures in Island of Blood: frontline reports from Sri Lanka, Afghanistan and other South Asian Flashpoints (Viking-Penguin). Where are the overlords now? And where are their beastly brood? Once spread its tentacles near and far. Now, America is at war with fundamentalism. The father of terrorism and hate. Who can predict its ultimate fate?